Note the explosive growth in global production from 1945 to 1970. Much of the oil and gas regulatory and legal structure was established during this period of explosive growth. In 1972 the largest swing oil producer at the time – the State of Texas – saw excess productive capacity shrink to zero. The Texas ‘allowable' – how much an operator could produce – was raised to 100%, the maximum legal limit. Liquids production from condensate and natural gas liquids increased substantially from 1985 to 2005. Without these incremental liquids the global supply situation would be much tighter. While global production is expected to peak in the 2010 time frame according to the presentation, global demand has been increasing at roughly 1.5% per year. 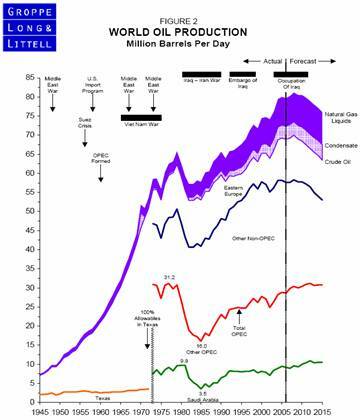 Global economic growth and crude oil use are strongly correlated. Long term trends in global supply and demand point to higher prices – possibly much higher prices. Note that conventional onshore natural gas production in the U.S. peaked in the early 1970's – about the same time U.S. crude oil production peaked. 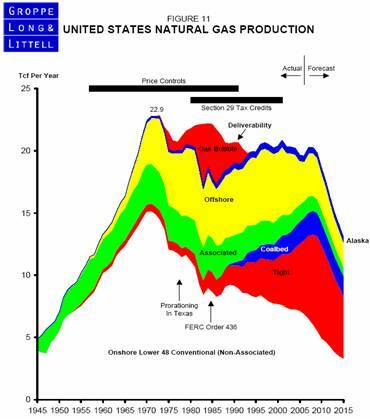 Note the explosion of ‘tight' and coalbed methane production since 1990 – these are sometimes referred to as ‘unconventional' natural gas reserves. Much of the decline in natural gas production from conventional reserves has been mitigated in the last decade by the boom in the unconventional production. Many experts think the future U.S. natural gas production decline will be severe – which is why many planners expect imported liquefied natural gas (LNG) will play a major role in our energy future. Joseph R. Dancy, is manager of the LSGI Technology Venture Fund LP, a private mutual fund for SEC accredited investors formed to focus on the most inefficient part of the equity market. The goal of the LSGI Fund is to utilize applied financial theory to substantially outperform all the major market indexes over time. He is a Trustee on the Michigan Tech Foundation, and is on the Finance Committee which oversees the management of that institutions endowment funds. He is also employed as an Adjunct Professor of Law by Southern Methodist University School of Law in Dallas, Texas, teaching Oil & Gas Law, Oil & Gas Environmental Law, and Environmental Law, and coaches ice hockey in the Junior Dallas Stars organization. He has a B.S. in Metallurgical Engineering from Michigan Technological University, a MBA from the University of Michigan, and a J.D. from Oklahoma City University School of Law. Oklahoma City University named him and his wife as Distinguished Alumni.